Are you looking for a way to step up your restaurant game? Consider tablecloths – they’re the perfect way to dress up any laidback local-style restaurant. Create an instantly upscale atmosphere with our high-quality tablecloths: the perfect addition to any restaurant table. 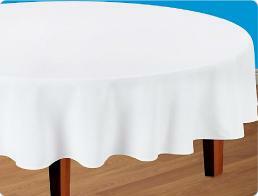 Our tablecloths are available in white, ivory and black, with select premium colors available. We provide only the highest-quality linens for our clients, built for the wear and tear of frequent restaurant use while still maintaining a luxury finish. Instead of buying low-quality table linens that wear out too quickly, get your tablecloths from a premium restaurant linen rental company with excellent customer service and quality products: Dust-Tex Honolulu. With all of the busyness that comes with running a restaurant business, it’s difficult to find time to manage your restaurant linen rentals. Plus, who has the space for an industrial laundry facility inside of a restaurant, the experience to train your employees in proper laundering techniques, and the time to keep track of it all? The answer is no one. That’s why so many restaurants on Oahu rely on Dust-Tex Honolulu to provide them with tablecloths, napkins, kitchen uniforms, server uniforms and towels. We make it easy for them! All you have to do is tell us what restaurant products you need, and we’ll deliver them clean, pick them up when they’re dirty, launder them and return them right to your door! When you rent from our inventory, you won’t need to worry about ordering more restaurant linen and apparel when you run out, repairing items that have fallen into disrepair, or counting all of your items on a regular basis to make sure that you have what you need for each new day. Let us take care of it for you so you can get back to the core aspects of your business. Contact us today to learn more about the products and services we can offer your business!